The two previous parts of this mini-blog have shown how to draw forms and how to write code to handle form events. This final part shows how to add some of the more exotic controls to user forms, like combo boxes, list boxes, multipage controls, spinners and option buttons. This blog is part of our Excel VBA tutorial. Wise Owl's main business is running Excel, VBA and other courses for businesses. The SpinButton allows the user to change the number of sugars ordered. 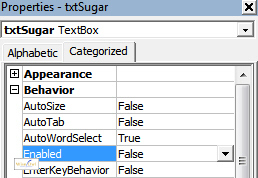 The textbox for the number of sugars has the Enabled property set to False - this means that a user can't change the value directly. If a user can't type in a number directly, you don't have to validate its data type or values. This is a big advantage! 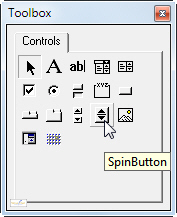 Here the SpinButton will control the value in the txtSugar textbox. It's more likely that you would attach code to the SpinDown and SpinUp events. Here we'll pass in the number of sugars to add (this can be negative). The routine makes sure that you don't set the number of sugars to be less than 0. When you click on the down arrow of the SpinButton, for example, it will call the AddSugar routine to add -1 sugars.